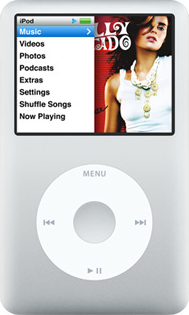 The new “fatty” iPod Nano was excellent. There’s not much to say about it, except that it’s amazingly thin and video looks decent. The screen is smaller than the iPod Classic’s, but not by as much as you’d think. Video is very watchable. The new colors are more pastel than before. The (PRODUCT) RED version is definitely pink (“light red” at best). But I wish they’d give us a 16 GB version for $249. It’s pretty sad that if Tiff wanted to upgrade her 6 GB iPod Mini from 2004 to a brand new Nano, three generations later, she’d only gain 2 GB of capacity. Unfortunately, the iPod Classic was extremely disappointing. I wouldn’t recommend it to anyone. Its most significant problem is the sluggishness of simple actions. The Nano and Classic both have an updated interface with photos and album art sprinkled around. I don’t like it — it doesn’t add any value, but it clutters the screen and makes navigation more visually confusing. Apple added many unnecessary new visual effects to simple operations such as track changes. Not only does the interface lag and stutter, but the music skips. It’s so bad that I assumed that the iPod I was testing was defective, so I tried others in the store and got identical results. The worst offender is the new Cover Flow view in the Nano and Classic. Neither of them devote enough memory to caching the album art images, so scrolling through them isn’t seamless — you’re just shown massive sections of placeholder art as it loads. On the Classic, the music skips like crazy. The Nano loads Cover Flow images much more quickly, and I couldn’t get the music to skip once. While the interface navigation wasn’t perfectly smooth, simpler operations like volume adjustments and track changes were dramatically better on the Nano. Because the Classic has a hard drive instead of the Nano’s flash memory, loading data is much slower. My previous-generation 30 GB “video” iPod is sluggish when it loads new tracks, but it has never stuttered during the simple operations that the Classic struggled with, and the audio has never skipped. The Classic’s hard drive isn’t to blame for its miserable usability — its new software is significantly more bloated and sloppily designed than the previous iPod generation’s OS. Skip the iPod Classic. If you need large capacity, find a clearance video iPod from the previous generation. I’ve used one of these for two years, and it’s excellent. I’m disappointed in Apple. They typically won’t release bad products, and I don’t know how anyone at Apple could stand behind the iPod Classic with pride.